For the past three years, ASHG has been developing education for non-genetics health professionals. Programs now exist to help pediatricians, OB/GYNs, oncologists, and others to integrate genomics into their clinical practice. We’re now hoping for your feedback to help develop new programs. Karen Hanson, Health Professional Education Programs Manager, presents a poster on ASHG’s efforts in genomics education for health professionals. To ensure that our education is clinically useful, we work closely with medical specialists from the relevant disciplines, sometimes establishing formal collaborations with those organizations. For example, the program we released last month on cfDNA screening was produced in collaboration with the Mayo Clinic. These types of collaborations insure that our educational programs are relevant, practical, and reach their target audience. They also give our partners greater exposure within the genetics community. 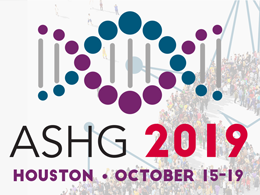 If you are a member of a professional society that might be interested in working with ASHG to develop clinical genomics education for that society’s members, please complete this brief survey. Thanks for your help! Michael Dougherty, PhD, is Director of Education at ASHG. Learn more about ASHG programs for K-12 students, trainees, health professionals, and the public.